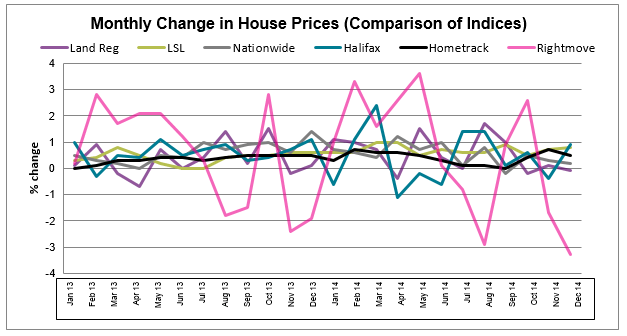 While house prices continue to rise, the rate of growth in house prices has slowed for the past four months. Home sales decreased by 2% in the past month and dipped below 100,000 in November for the first time since November 2013; 0.8% lower than a year ago (Source: HMRC seasonally adjusted figures). Mortgage approvals are down to their lowest level in 16 months according to Nationwide and 23% below their peak in January 2014 according to Halifax. 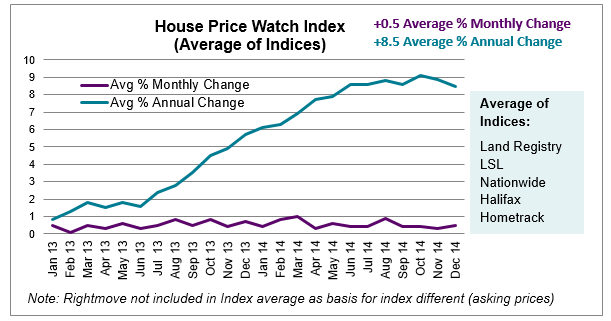 The major indices predict annual house price rises for 2015 in the range of 2% – 5% (compared to 8.5% in 2014). Looking ahead, housing demand is expected to be supported by steady gains in employment and wage growth and continued low mortgage rates. Reports indicate consumer confidence remains optimistic and retail spending in November was its highest in a decade. 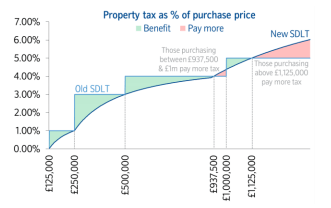 According to an analysis conducted by Nationwide of the abolishment of the Stamp Duty slab structure, 98% of buyers will pay the same or less tax. Only those purchasing homes of more than £937,500 are set to pay more stamp duty. The greatest impact is likely to be for those buying just above £250,000 who could save £5,000 in tax (or 2% of the purchase price). 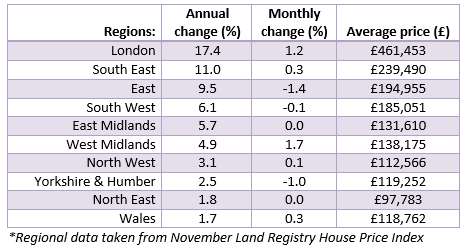 (Chart source: Nationwide analysis of Land Registry data 2013/2014). According to a regional analysis conducted by Nationwide, those in the South of England where average house prices are higher will benefit the most from Stamp Duty changes. Estimates suggest 85% of transactions in London, the South West and South East will benefit from the changes compared with approximately 50% in the North, North West and Yorkshire and Humberside. 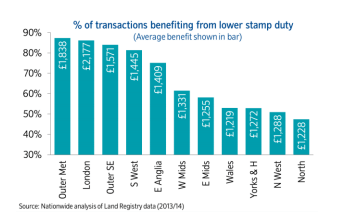 Of the transactions resulting in more stamp duty to be paid, two thirds are in London (where there are more high value transactions than in other regions). Rightmove notes that there are winners and losers with the Stamp Duty changes in London and that the additional threat of mansion tax on properties over £2 million will remain a deterrent until at least May’s election. London and the South of England experienced higher rates of house price growth than Northern regions and Wales.